The latest plans from new owners of the former Statler Hilton Hotel call for reopening the 55-year-old downtown Dallas building as a hotel. The hotel was among the finest in the nation when it opened in 1956, but it was abandoned and has been decaying for the past 10 years. The city of Dallas has rated it as a dangerous building in the past several years because of serious code violations. In March, Ricchi Dallas Investments purchased the hotel building at 1914 Commerce St., along with the former Dallas Public Library building beside it at 1954 Commerce St. 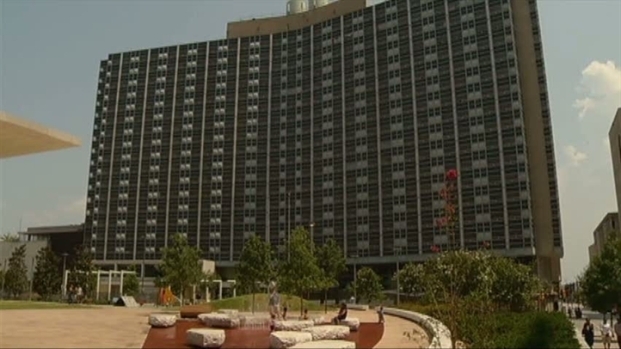 There's plenty of talk about what will become of the former Statler Hotel in downtown Dallas. Now, according to city leaders, the Statler's new owners may restore the hotel to its former glory days as one of the city's swankiest hotels. The library closed in 1981. On Monday, a Dallas City Council Committee received the latest plan to renovate and revive the buildings. Architect Jerry Merriman said the hotel building is ideally suited to be a hotel again. "We can still develop the ground floor for retail and restaurants and have some mixed use that way, but we think the real use is residential or hotel," he said. Merriman said upper floor layouts are well suited for use as suite-type or efficiency hotel rooms that could serve a variety of people who work downtown. The former library building would be renovated for street-level retail and other commercial uses. The City Council Committee endorsed the plan Monday. "I think there's a big difference between having the buildings in the state that they're in today versus having them remediated," Councilman Ron Natinsky said. The owners want the city to help pay for expensive asbestos and mechanical problems that have scared other developers away. "The fact that there is private money, substantial money going into it means somebody has faith that this is eventually going to become something," Councilwoman Ann Margolin said. The abandoned hotel and library buildings are across Commerce Street from the city’s new Main Street Garden Park. The park is also surrounded by the Merchantile Building, which was recently renovated with apartments, a former department store that now houses university classrooms and the old Dallas City Hall which is soon to become the University of North Texas Law School. John Crawford, with Downtown Dallas Inc., said the Statler Hilton is a key to completing the area, "for three different reasons, perception, life safety, and appearance." It makes a huge difference in terms of what we're doing downtown," he said. Other plans for the Statler Hilton suggested over the years have included condominiums or an entertainment center with theaters and maybe bowling. But Merriman said the city-backed Convention Center hotel opening later this year would help attract convention business to Dallas and boost the need for additional hotel rooms elsewhere downtown. "The interest from hotel operators and various flags that operate around the country has been very high, so we think that a lot of operators are seeing the potential of Downtown Dallas," Merriman said. The full Dallas City Council is scheduled to vote on the hotel plan June 22.